Quick and easy recipe for busy people!!! Shumai (steamed dumplings) is a type of traditional Chinese dumpling served in dim sum. I substituted half of the ground pork with mashed soybeans. 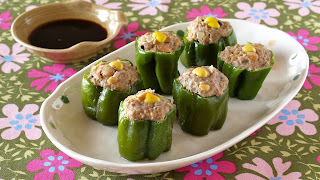 Instead of using Shumai wrappers, I used green peppers. 3. Place them on a microwavable dish, cover, then microwave at 500w for 7 minutes. 4. Decorate the top with a bit of Karashi (Japanese mustard) if you like. Serve with soy sauce. You can bake in the oven or steam in a frying pan.